Torque Solution polyurethane engine mount inserts fill the void in your stock mounts. This allows the mount to retain its solid shape and avoid the common cracking issues. Made from 75a durometer polyurethane insert includes a washer for each of the mounts. 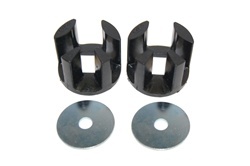 These give you improved traction and reduced wheel hop without to much vibration. Each kit comes with an insert for the upper and the lower mount.